Chain conveyor is a conveyor in which endless chains of various types travel the entire length of the conveyor, transmitting the pull from the driving unit and, in some cases, carrying the whole weight of the materials to be transported. In cement and similar industry, Drag Chain conveyor is used. They are conveyors with endless chain without attachments, which drags material through a trough. 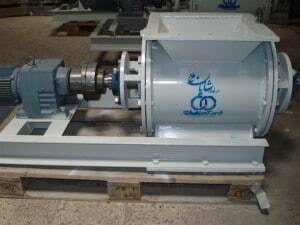 Their operation is based on the continuous movement of a chain place in a rectangular-section steel trough with airtight cover, coupled up to a drive gear and an idle wheel. They are used for horizontal, inclined or vertical conveying of countless types of bulk materials. Screw conveyor is a transporting device, capable of handling a great variety of materials which have relatively good flowability. Flowability is defined in the CEMA Materials Classification Standard, and denotes the degree of freedom of individual material particles to move past each other. This characteristic is important in screw conveyor operation as the screw helix, mounted on a central pipe or shaft, rotates within a fixed trough or tube, pushes the material along the bottom and sides, shearing the material in the radial clearance between the helix and trough and causing the material to tumble upon itself as the moving face of the helical flight tends to lift the material. 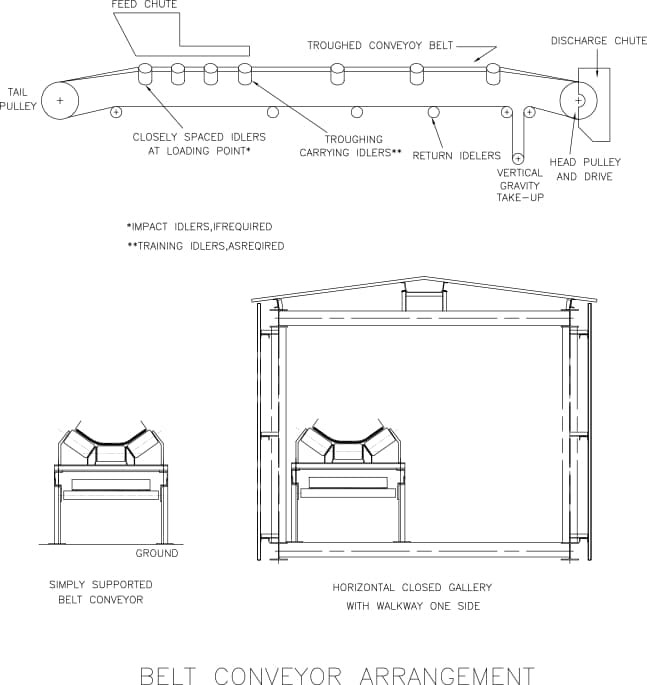 A typical screw conveyor layout is shown in figure below. Paddle conveyor screw has formed steel blades mounted on rod shanks inserted through the pipe. Conveying action can be controlled by adjusting the angle of the paddles. They are used for mixing, blending or stirring dry or fluid materials. A typical paddle screw conveyor layout is shown in figure below. 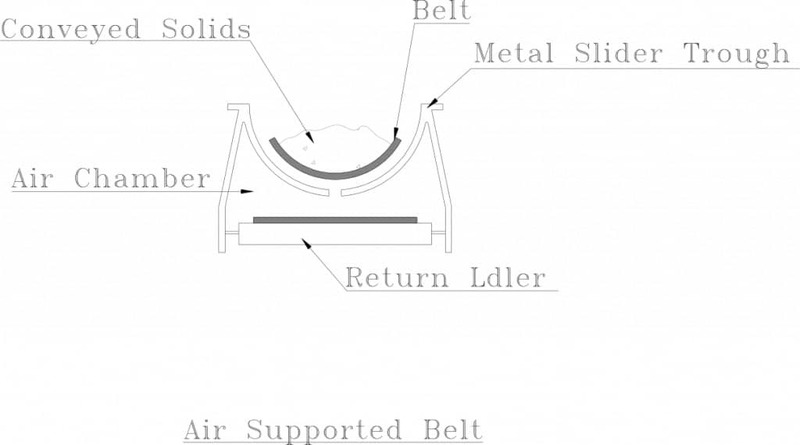 The belt, which forms the moving and supporting surface on which the conveyed material rides. The idlers, which form the supports for carrying and return strands of the belt. The pulleys, which support and move the belt and control its tension. The drive, which imparts power to one or more pulleys to move the belts and its load. The structure, which supports and maintains the alignment of the idlers and pulleys, and supports the driving machinery. The air supported belt or air slide is a bulk handling belt conveyor that floats the belt on a layer of air and eliminates the need for trough idlers. This principle was developed in the Netherlands early in 1970. A schematic cross-section is shown in figure below. The air supported belt functions identically to a trough idler conveyor in all respects, expect for the method of supporting the loaded belt. The system uses conventional head and tail sections, drives, return rolls and belting. However, instead of having a trough idler every 3 to 5 ft, the belt runs in the metal trough that is rolled in a true radius. A small centrifugal blower forces air into a sealed plenum beneath the trough. From there, it passes through a special array of holes in the trough and escapes up the sides to form a thin film of air under the belt. The conveyor Equipment Manufacturing Association defines a bucket elevator as “ a conveyor for carrying bulk materials in a vertical or inclined path, consisting of endless belt, chain, or chains to which elevator buckets are attached, the necessary head and boot terminal machinery and supporting frame or casing”. Most standard conveyors have limited capabilities for elevating bulk solids beyond a 20° incline. As plant layouts and other considerations often require materials to move at considerable elevations within relatively short horizontal distances, special type of equipment was developed for this purpose. This equipment is often referred to as “elevators ” or “ conveyor/elevator ”. Rotary Valves (also called airlocks) and rotary airlock systems allow free flowing solids to pass from one valve space to another valves space with a different air pressure. A rotary valve is of no use by itself. Rotary airlock, airlocks, and rotary valves are useful as one component in a bulk or specialty material handling system. In order to function, rotary valves must have tight valve clearances and powerful motors. Any part of the human body in the way when a rotary airlock blade closes with the housing will be cut off.